Better late than never I guess. Part I was written all the way back in mid-October and focused more on our discovery of Assembly Hall. Now let's get to the game. My eyes quickly focused on the recently completed stadium renovation in the background. A very neat stadium, seated over 50,000 but felt very intimate. It certainly helped that me, Scott and Tyler could basically go wherever we wanted.....and we did. Hiller is tall. That is all. It was cool watching him warmup from the field level. Soon after this we spotted his parents in the stands and took some time to visit with them. Very nice people, as most in Orrville are already aware. Both schools are addidas schools so I felt right at home. This wouldn't be the last picture I'd take of a players spikes. Band. In the background is the IU student section. This was maybe 10 minutes before kickoff. Thier students were late arriving to say the least. I imagine they're very punctual for basketball season. Such is life in Bloomington. IU captains. I'm not going to overstate it, I'll simply say this. Chase Hoobler is just as big as any of these guys, pretty sure #46 and #43 were linebackers. Team intro. That cart thingy in the endzone was loaded with pyrotechnics. Do you think they had the area cordoned off? Nope. Again, you could go wherever you wanted to. The fireworks went off directly above me. Game on. This is with no zoom. We were THAT close. Very cool. These 3 were interesting to watch. They were obviously all 3 backup QB's and they'd run through a series of signals, calling the play in. I'm sure it's done to disguise signals, as I'm sure one guy is calling the actual play and the others are faking it...but I'm sure it rotates as to who is actually calling the play. They were all very well choreographed, did the signals in perfect unison. Made me wonder if they get together in front of a big mirror and practiced together. This guy was very interesting. We came to find out that he was the guy who alterted the officials when the TV network was going to, and coming back from a commercial (he's the TV timeout guy!). When they would go to commercial, he'd step out on the field, and then step back to the sideline when the commercial was over. It was literally the easiest job I've ever witnessed someone else do. He held all the power. Nothing happened until this guy was off the field. I'd like to know where a guy can land this kind of gig. Back to shoes. I noticed this guy on IU's sideline. Wondered why he had two different color of adidas stripes. His right shoe stripes were orange. I could see if it was red, this was confusing, and I didn't see other teammates sporting the same look. Meanwhile, Tim Hiller was moving the Broncos down the field. Halftime...and that meant time to get to the pressbox. A very crowded elevator ride up led to this view. Oh, and free food. Can't forget about that. Had to be a little more respectful in the pressbox, so not as many pictures, but we did walk right past Bill Polian, President of the Indianapolis Colts, and had another run in with IU basketball coach Tom Crean. He snuck in the back door and the pressbox (from a connected loge I'd assume), grabbed some food and was gone. Also, the reporter next to me was flipping through a gun magazine. I guess this is what covering IU football will do to a guy. This was a neat space. Just beyond the one endzone, basically a mini version of the field. Great place for small kids to burn off energy. Parents can keep one eye on the game and the other on junior. Every field should have one of these. Cool scoreboard. 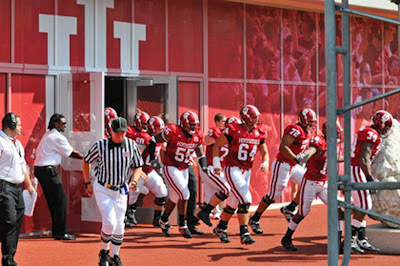 The candy stripe poles mimic the candy stripe warmup pants that IU basketball have made famous. You can see the score is 23-17 in favor of IU. Tough loss for WMU, they were driving for the would be winning score when they fumbled the ball. Really felt like it was just a matter of time until they punched it in...but it wasn't to be. We were able to speak with Tim for a few minutes after the game and he was very cordial (you'd never know he had just come out on the wrong end of a loss). That's it. A very fun day. Maybe we'll make another drive when Chase Hoobler is an All-Big 10 linebacker. Really enjoyed this two-parter. Felt like I was there with you. Your Assembly Hall story reminded me of when a friend and I found an unlocked gate to Ohio Stadium late at night. We had the run of the place. glad you enjoyed. The whole time (both at Assembly Hall and at the game) I felt like I was breaking some kind of rule. i had never enjoyed that much access before. I could have probably ran on the field and no one wouldve batted an eyelash. Indiana folk are very laid back.